Leslie Markle joined the Mildred Lane Kemper Art Museum in 2012 as the inaugural curator for public art. In this role, he is tasked with stewarding/steering/shepherding the Art on Campus program, a percent for art program started in 2010. I sat down with Leslie recently to ask him about his work while the first artworks to be installed were arriving in their new homes on campus. Jaume Plensa, Ainsa I, 2013. 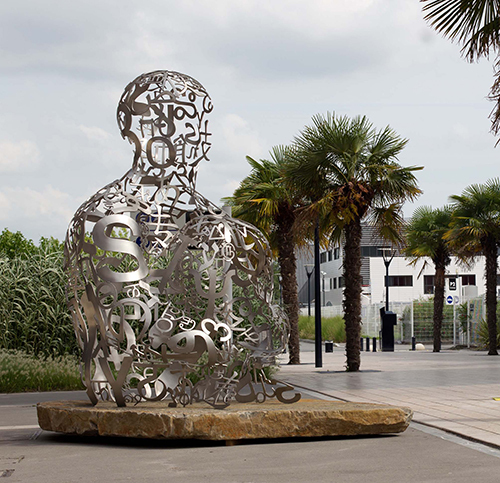 Installation view, Jaume Plensa à Bordeaux, Bordeaux, France, 2013. Stainless steel and limestone, 126 x 84 5/8 x 149 5/8″. Mildred Lane Kemper Art Museum, Washington University in St. Louis. University purchase, Art on Campus fund, Olin Business School, 2013. © Jaume Plensa, courtesy of Galerie Lelong, New York. Photo by Thomas Sanson, © Ville de Bordeaux. Allison Fricke: What is a typical day for Leslie Markle at the Kemper Art Museum? Leslie Markle: There really isn’t a typical day. It’s usually a hodge-podge of different things. It involves research… some research, a lot of administrative work, communication with other departments, and the work of cultural planning, since it’s an integrated program there’s a lot of looking at that. For instance, today, I was down in Facilities. Since this is a percent-for-art program there is a lot of coordination with Facilities and Planning, who has been involved with master planning for the campus and creating also a new framework plan for the East Campus. So just the planning that goes into any development, are things I need to learn about for particular projects. Then in dialogue with project managers and the director of campus planning, Jamie Kolker, we talk about approaches for art integration and that discussion is brought to committees, who basically make the decisions. AF: So then how involved are you in the selection of the artists? LM: It’s all really a dialogue with the stakeholders that starts with the physical and social context of the campus. So that leads into a discussion of artistic approaches and based on some consensus about artistic approaches, I’ll put together a short list, but even that is really done in dialogue with the curatorial staff here, of course with Sabine [Eckmann]. The short list, even though it’s defined as a curatorial process, is also a dialogue among a number of people, including Carmon [Colangelo] also. Ultimately the committee chooses the artist, not from a pre-qualified pool, but a short list created by either myself or whoever is the lead curator for a particular project. They’ll bring those artists to the committee with justifications and interpretations of their work to help educate the community if they’re not familiar with those particular artists. But the ultimate decision is made the committee of stakeholders, rather than art experts – so people involved in the particular capital project. LM: Right, so it’s people who use the building, the relevant dean of the school. And the Provost is always on the committee for academic buildings, and for non-academic building it’s the Executive Vice Chancellor of Administration, Hank Webber… he takes the role of Provost in that case. Or for instance Justin Carroll is involved in a number of projects that have to do with residential life since he’s the Dean of Students. Since the percent-for-art program applies to both academic and non-academic buildings. AF: It sounds like your work is then maybe a little bit different from what we might think of with a more traditional curator, like what Kate [Butler] might do. LM: Sure, but Kate’s actually curated two projects: Umrath and Cupples. It is different in that there’s a different kind of accountability involved. Although it’s similar to curating a museum exhibition, I would imagine…. I’m just curating my first museum exhibition actually! They create justifications, a prospectus for that, but in this case rather than a single artist that the curator chooses, they have to create a pool of artists that seem appropriate to the stakeholders. And since it’s not a peer-reviewed panel process, that’s really what differentiates it most significantly, because you’re talking to people who are not necessarily even interested in art. They may have a lot of expertise in art, they may event collect art, or they might be people who have almost no interest. So there’s a range of people who may end up as stakeholders on a committee, so in a way, you act as an apologist for contemporary art, not in a general sense, but for every particular artist. With justifications you try to explain their art to a lay audience, which is not a simple thing to do necessarily because contemporary art is very complicated. AF: I imagine that’s something you have to think about in the selection process. Not just explaining it to the people who will select it, but also thinking about what will appeal to anybody walking by the artwork. LM: Well, you can’t really gauge public opinion… people say that they do, but there are only constituents really, there’s not any kind of public. So there are particular constituents that might take an interest in the project, and of course there’s the Wash U community, but that’s a transient community really, it changes over time. So I mean, usually people’s reaction – there are people who have studied this – but usually people’s reaction… there was someone who wrote a dissertation in sociology and they looked at reactions to public art, and usually it has a lot to do with the physical context. Anyway, her conclusion was it has a lot do with the physical context of the work. So this is a dissertation by a sociology student out of the University of Chicago. And she didn’t look at a broad range. Her sample size was fairly small, but I think her conclusions are sort of vetted in my experience: that the context is very important, and the relationship with the artwork… not just the physical context, but the social context. One of the points that she makes actually is that the cultural authority of institutions, like the Kemper for instance, don’t really extend into the public realm, that the public has… even though this is a private university, if you’re talking about it as public space, the public has a sense typically that they should have some say in how public space is designed. Those are lessons that people have learned in community design also. And public art really came after that, after the rise of community design and community design processes. AF: Thinking about the way the social context surrounds a piece of art, I’m wondering if you see any trend amongst the various public artworks that have been selected already? LM: We don’t really have a master plan for the artwork because the trigger is really the financial mechanism. So the long-range plan… the commissions are going to be in proximity to whatever capital project they’re related to, so if you look at the long-range plan for development, it ends up being spread out throughout the whole campus pretty evenly. Even though most of the campus is highly developed already, with the exception of the East Campus, the continuity is really the Museum’s focus on collecting art of our time and a kind of profile of artists. We’re really looking for artists with an international profile, which I think all of them so far are pretty well-recognized internationally as artists. Even for some of the smaller projects that we’re doing. AF: Like Spencer Finch and Ayşe Erkmen? LM: Yes, Ayşe Erkmen and Spencer Finch would be two of the smaller projects and they’re great artists. I don’t think you’d be able to capture artists of that caliber if the program was not connected to the Museum, or run, basically, through the Museum. So I think that’s one distinguishing characteristic. And if you look at other art on campus programs, there are maybe a dozen well-recognized programs that are pretty high caliber and then there are other ones where a lot of works were donated and pieced together in different ways. So they don’t have a continuity of vision because there’s been a pretty big time span and the collection has been assembled in different ways. Not just through percent-for-art but also through donations. AF: Have you had a favorite experience thus far with the art on campus program? LM: Well one of the things I like about it is the collaboration, particularly working with Planning and Facilities. To me that’s really fascinating because that’s such a huge task really in comparison to commissioning the artist. It’s fascinating to be a part of watching and learning about the history of the campus, which has quite a significant history, and also being privy to how it’s going to develop. Being a small part of that development has been pretty interesting. I really like that collaboration, working with Jamie [Kolker] and all of the project managers. AF: Is there anything else you wanted to add about the Art on Campus Program? LM: As Carmon [Colangelo] mentioned this morning, it is going to be a huge presence on campus in a few years. There’s nothing here now [laughs], at least in terms of percent-for-art commissions, but in a few years there’s going to be a significant presence of art. Hopefully that will really create a sense of community within the campus and will also be kind of an outreach effort on the part of the school and the Museum to draw people to the East Campus.